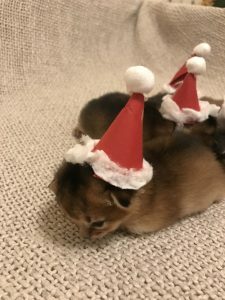 Christmas is finally here! It´s been an intense last few weeks for sure. Nala has been fully occupied with her new kittens, and the rest of the family are just amazed at how fast kittens actually grow. 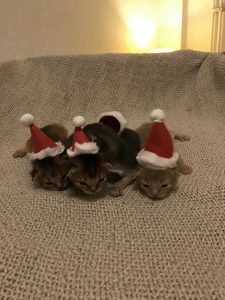 Human mom Stina couldn’t help it; We HAD to make tiny little Santa hats for the kittens. 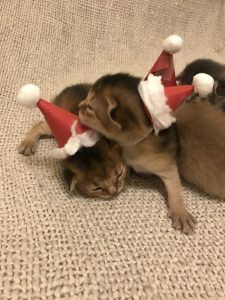 Needless to say, the result was just Christmas cuteness overload! 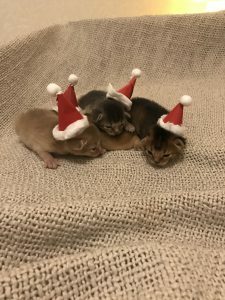 Between work, kittens, Christmas preparations AND planning for 2018… ,well let’s just say we’ve been very very busy. 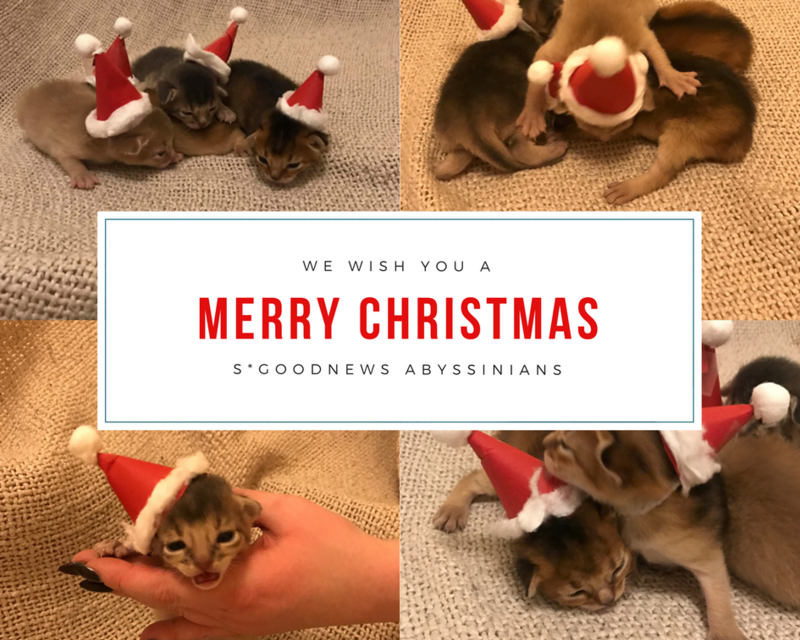 But we (Agnetha in Piteå and Stina in Stockholm) want to take this oppurtunity to wish ALL of our friends a very Merry Christmas! Tiphaine Favere, Abyssins d’Abystyle: Thank you for our princess, IC Abystyle’s Ma Demoiselle JW. Words are not enough. 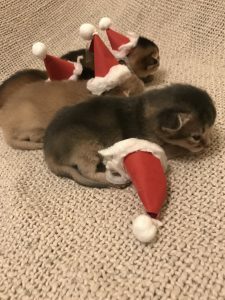 Marianne and Lars Seifert-Thorsen, Luna-Tick Abyssinian: Thank you for giving us the opportunity to mate Nala with Kiksen. You are the best, før helvede! Margit Bøgeskov Thomsen, DK Wimmerhale Abyssinians: As always, thank you for Leia. And for all of your generous and valuable advice on breeding matters through the years, what would we do without you? Anne Loehr Schambye, DK Kronhede Abyssinians: Thank you for being the best and most lovely company at shows! And thank you for giving GoodNews Mandela’s first litter of kittens the best possible start in life. Anne Kontula, FI Nebuankhet Cattery : Thank you for one more year of great cooperation. You are the coolest! Carolyn Osier, US Wil-o-Glen Abyssinians: Thank you for trusting me to buy Pietro! His type, lovely color, fantastic coat and wonderful personality has contributed SO much to GoodNews breeding. We will always be grateful to you for all of his beautiful offspring! Annika Ericsson, Sigge and Anders: Thank you for taking such excellent care of Mandela and for everything else. Gunny Blomgren: Thank you for being the best human mom to GIP S*GoodNews Orlando, and thank you for being a great friend and travel companion! Sebastian Lakatos: Thank you for supporting all of our crazy travelling to shows, helping us book airline tickets, hotels etc. Thank you for not complaining. Thank you for keeping us on the right side of crazy. You are our most valuable supporter! Thank you for cleaning the litter boxes, and for all of the heavy lifting. And for the hugs! And last, but not least: Thank you for being there for Nala when she had her very first experience of giving birth. We love you so much and you are the best cat dad ever. Harri Saari, FI SweetPurrs: Thank you for all your help with bringing CH S*GoodNews Malala home. We are secretly in love with both you and Benjamin. You are both amazing people and we are so lucky to know you! To ALL of you, and to all of our other dear friends and family: A very Merry Christmas! We hope to see as many of you as possible during 2018! 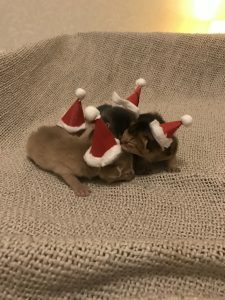 Nours and Mandelas kittens are here!